Welcome to the new most amazing Water Slide Jet Ski Park Racer gameof the new generation. In this game you enjoy different categorieslike race with super-fast speed Jet Skis on cool water tracks andface some obstacles during the race. If you like the Jet Ski racinggame then you definitely have to play this game. Amazing soundeffects & smooth controls of the game will make you play thisgame and this game addictive. 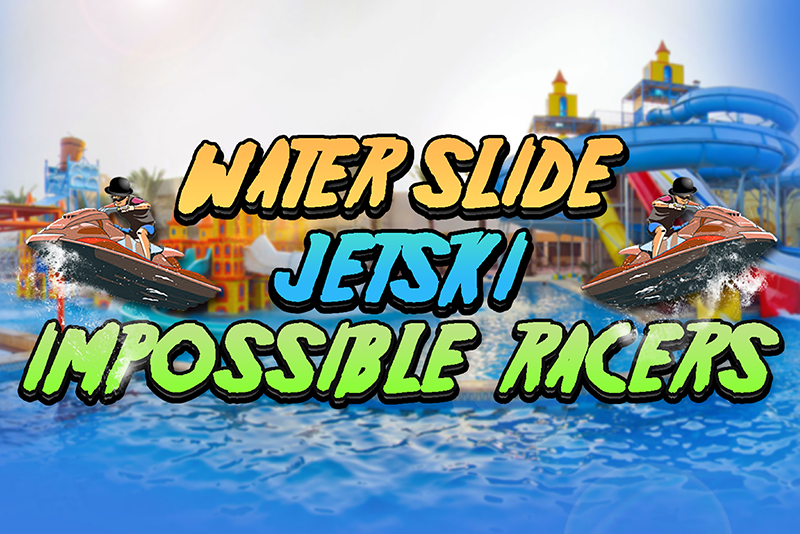 Get ready for play the beautifulWater Slide Jet Ski Park Racer game .You have played many waterslides games or Ski racing games but in this game you will enjoythe most beautiful water effects, extreme water slide experience,race on different tracks, race with opponent and epic Jet Skimoves. In this game you will also enjoy the lovely environment ofWater Park. Game play: We are back with the most fanciful andsuperb Water Slide Jet Ski Park Racer 3D simulator game. This gamehas 10 unique and challenging levels. Each level has manycomplications. Every level is almost different from each other. Thegame play of this game is very humble. You need to race with otheropponents which is fast and furious Jet Skis. You choose yourfavorite Jet Ski. The Water Slide Jet Ski Park Racer is a levelgame. The 1st level you simple race and reach the target pointbefore your opponents as well as win the round. The 2nd and 5thlevel during the Jet Ski driving on the beautiful ramps you facesome obstacles such as stone, tunnel and also other. If once youhit these obstacles then your Jet Ski is crash and you fail yourlevel. You need to drive Jet Ski fully and avoid these obstaclesand complete the level. In the 3rd level you race with otherfurious Jet Ski. They will try to collide your Jet Ski. Before thisthey destroy your Jet Ski. You need to your opponents collide 3times and reach the finish point. The 4th and 6th level you racewith opponents by use you’re driving skills and complete the level.The remainder levels you need to race with opponents. During therace you face obstacles. You will be need to avoid these obstaclesand reach the fix point before your opponent. In which the game youfeel 3D environment and best camera angels control. Key features: •Play the most amazing Water Slide Jet Ski Park Racer game • Enjoybeautiful water effects and epic Jet Ski moves • Race withopponents on different tracks • Extreme water slide experiences •HD graphics & best sound attraction • No internet required TheWater Slide Jet Ski Park Racer game is especially designed forkids, teenagers and all those peoples who are waiting the waterslides as well as Jet Ski racing games. You race with opponents andneed to complete all the levels with using your best drivingskills. Let’s play and enjoy the most amazing game of 2018. Welcome to the new grand ramp racing game of next generation stuntsin Free Fall Jungle Mega Car Ramps 3D Stunts. This mega ramp gamewill accept with warm welcome because of impossible biggest rampever. The skydiving stunt car racing game will be serving best forhardcore vehicle used in this mega ramp game. In this tunnel twistmega ramp car gt racing extreme stunts used for performing besttricks on longest impossible free fall tracks and beat youropponent to show the finest skills for this type of ramp racingcompetition. So drive your sports car or other heavy weight vehicleon the magnificent jungle mega ramp vertical slope track andfinally free fall jumps to the some area in jungle with greatcontrol and ability. Drive like a Stuntman, fast and be furious totake the best jump to perform different stunt in impossible jungleramp in a unique manner. Be careful on the narrow edges of thetricky ramp where you have risk of fallen off the ramp and takenbehind by other opponents in your leaderboard. So do your best astake this your full and final racing battle by playing Free FallJungle Mega Car Ramps 3D Stunts? Game Play: Start your mega jungleramp racing challenge where you have four different types ofvehicle such as bike, sports car, ATV bikes & monster truck.These all unlocked step by step as you further advance in Free FallJungle Mega Car Ramps 3D Stunts. In the first five levels you alsohave time limit for free fall racing ramps. As you free fall formthese fast ramps you have different environment to survive likesnowy hills, lovely jungle, and Volcano & Off-road uniqueexperience in this car jungle mega ramp stunt racing. From 6thlevel you also face some kind of hurdle as you fall from sloppyUltimate mega ramps doing stunts in your extreme ramp stuns race.Escape yourself from these hurdles in the shape of Bullet Train,Wild Animals and fast Planes coming in your way in ramp racingcompetition. Keep free fall jumping with landing accuracy to beatyour rivals in impossible mega ramp 3D stunt racing games. Soperform these epic gravity challenging stunts with real adventureand action pack mega ramp stunt racing game simulator. Free FallJungle Mega Car Ramps 3D Stunts Features: • Impossible space trackssimulator game • Extreme kind of stunts & tricks • Veryadventurous gameplay • Explore different racing environment •Amazing 3D graphics & sound • Different missions in levels toachieve This Free Fall Jungle Mega Car Ramps 3D Stunts racing gameis especially designed for fast and tricky spacy tracks lovers whowant to do adventure in these kind of stunt racing car ramp gamesalso do crazy stunts with normal and heavy weight vehicles. Theseare some kind of extraordinary things that everyone want to do butcannot happen in normal life because that only can done with thisFree Fall Jungle Mega Car Ramps 3D Stunts, that will provides youto do with action adventure and much more that anyone want to dowith passion and excitement. Welcome to the most amazing and thrilling missions High School FunVirtual Girl 2018 where you enjoy high college life. Each people inthis world like his high school hoops days. Enjoy your back toschool sale days when your mom and dad leaves you to your schoolgirl life on the first scholar’s days. Indulge with the student andmake a new ragazza friends. Have a crush your colleagues in highschool simulator. If you love the virtual best school girl gamethen you will surely love to play this virtual school girl life 3Dsimulator game. Enjoy the most incredible best High School Fun:Virtual Girl 2018 with thrilling mission to play with. Unlike allother school journey simulator games and play this high scholarsgame which you feel actual life of a yandere girl game. If youreally love the school simulator games then you will experience theschool girl life, attend the classes, confess the class mates andtalk with your friends. This is especially games for women whichthey are like anime girl wallpaper. Game play: Once again we areback with the amazing High School Fun: Virtual Girl 2018 game withexciting missions. In the game you play as a school girl. Start thegame you are in house woke up and get ready for the school byvirtual dressing. It’s time to breakfast. After the breakfast youneed to wait for the school bus. Sit on the bus and take you forthe school. In the school you go to your class and sit your seatAfter some time you need to go another class room for take yourbook. In the break time, you play with your friends and talkingvirtual. You race with your child friends and try to win. In thishigh school you have find basketball, football, high school storyand 3D girls. During the class room you are bored and try to bunk.If once you bunk the class then you need to save side that anyteacher did not see you. If the any teacher see you during the bunkyour level is failed. Now it’s off time. You sit on the school busand reach in the house. In the house you need to learn your testfor next day. If you pass the test next day, your level is completeotherwise your level will be failed. In the game you will be enjoythe 3D environment of house, roads and beautiful school. Keyfeatures: • Play as a school girl in the Virtual High School • Goto school on school bus • Take selfie with friends • Have fun withyour class mates • Smooth controls and camera angles • Amazingsound effects and 3D graphics • Beautiful Environment and Smoothcontrols The High School Fun: Virtual Girl 2018 is speciallydesigned for the kids and those people who are loves the schoolgirl games. During the game you remember your school days and theybring a smile on your face. You play as a school girl and do allactivities which a normal students doing in the school. Let’s playthe amazing game and enjoy it’s fun. Welcome to the Virtual world of Sea Hospital Simulator in CoastGuard Beach Hospital Rescue Simulator. Become the Coast guard thatwill Rescue the civilians who are in trouble in the deep Sea. SeaHospital is little far from the beach so you need to move theCivilians in trouble to the hospital in an ambulance or helicopter.Enjoy the great Sea City Environment with the most advance Graphicsof 2018. Flying a Helicopter is the most enjoy able experience of alife time, fly a helicopter and save the lives of hundreds bytransporting them to the hospital in time. Coast Guard BeachHospital Rescue Simulator is a Sea Rescue Game with adductive gameplay. Rescue Missions in the sea are not possible without thrillingboats and Jet Skies, you will need to reach to the civilians intime other vise they will drown into the deep sea. With the help ofspeed boats and Jet Skies you will be able to carry civilians fromthe sea and transport to the beach from there the ambulance will bewaiting for them and will take them to the Sea hospital. Game play:In Coast Guard Beach Hospital Rescue Simulator you will be theSavior Hero of the Sea. You will be playing as a diver and a Doctorin this Sea Rescue Mission game. You need to help the civilianpeople in the sea enjoying and playing in water if something wentwrong. You need to ride a speed boat and reach the people in timeto save them and get them on boat and transport them to the beachfrom where the ambulance will be waiting for them that will takethem to the hospital. You will also be riding a Jet Skye to helpthe people near the beach as the speed boat can’t float in shallowwaters. Feel free to enjoy the ride as much as you can until youreach the person in trouble in time. Enjoy the joy full ride ofSpeed boat and Jet Skye in Virtual Hero Sea Hospital RescueMissions. Sometimes you will be needing help from the skies to savethe poor civilians in water so you will be getting the help formthe helicopter squad that will rescue the persons from the waterand will transport them straight to the hospital without any delay.Helicopter is the fast way back to hospital coz of no traffic noroad turns, and no need to stop again and again. It will drop youstraight on the roof of the hospital. You will need to save thepeoples from the surface of water as well as the civilians stuckunder water after their ship has sunk. You will need to dive underwater and reach the person and bring him/her back to the surfacebefore he/she drown under water. Key Features: • Helicopter, SpeedBoat and Jet Skye to enjoy • Mind Challenging Rescue Missions • Allnew Environment Underwater, City and Beaches • More than one playerto play as • A lot of new Scenarios to play in • Dynamic soundeffects and Cut Scenes • Story mode missions Coast Guard BeachHospital Rescue Simulator, is the game of the year and you willenjoy the most amazing rides along with the most Adductive gameplay of the summer, year 2018. Play and enjoy this amazing game.Game is not just for kids but also for the people who are afraid ofwater and Sea to know that there will be someone nearby to savethem if they got in trouble. Be the ultimate Wild Wolf you always dreamt about, the most amazingWild life adventure is waiting for you in the Ultimate Wild Wolf VsUgly Monster. The Ultimate battles with the Most Ugliest Monstersyou have ever seen is waiting for you in this epic Wild wolf game.Live the dream life of a Wild Wolf and fight like him if needed.Raise your pack and become the strongest Animal Community in theJungle.The epic battles have begun with the ugly Monsters like RockMonster, Bear Head and Stack Head. Be the most Wild Wolf you canever be to save your Pack because one wolf can’t survive in thewild alone. And the Alone wolf is the wildest animal in the jungle.Destroy anyone who wanted to harm you or your pack in the UltimateWild Wolf Vs Ugly Monsters.Game Play:Raise the Wolf Pack to theUltimate Wild Wolf and be the most amazing animals in the animalkingdom. You will need to protect the pack from the other wildanimals. Save the small children of the pack from hunger, thirstand the most dangerous Ugly Monsters of the world in the UltimateWild Wolf Vs Ugly Monsters. Save the Jungle world from thedeadliest Ugly monster of the outer Rim and be the Wolf Savior ofthe Jungle kingdom. You will need to fight the Bear Head, StackHead and the Rock Monster till death otherwise you pack will die infront of you and you will suffer. Survive from the most dangerousenemy the Ugly Monster in the Ultimate Wild Wolf Vs Ugly MonsterGame. This is not a simple game but is the simulator of a real wolfliving in the wild with his pack, a wolf is as strong as his packand be the pack a jungle need in these times of need. You need yourpack and need your family to win this War, and your family needyou. Your clan need you to fight and stand as there leader in thebattles to come.Key Features:• Simulator of a Wild Wolf Adventuresslife• HD sound effects with Surrounded Sound • Adductive Game play•Open World Mode• Amazing Creatures to play with and fight withRaisethe population of your pack and be the strongest one to challengethe Ugly monsters. Protect, feed and raise the pack like you ownfamily. Be the one saving the Jungle from the Ugly Monsters in theUltimate Wild Wolf Vs Ugly Monsters. Move around the open world andenjoy the most stunning environment of all time. Virtual Step Brother is a real life simulation game. A family funsimulation of a Virtual Step Brother family Simulator, and how heteases his family in daily house hold works. The game play is inthe house and you can move around the house and can interact withdifferent things as well as helping mum. As a virtual Step brotheryou have younger Brother from another mother and even have a petDog. You need to take care of both, Younger sibling and Pet Dog asthey are not yours. There are also Parents around the house andthey sometime need your help, you to help them as well but makesure they don’t find out what’s is going on in your mind. All youneed to do is to be cool and enjoy the game Play. There arecountless possibilities in what you can do in this game as it is asimulation and role play game of the Real Life. It’s time to takean elevation from the kid to super Step brother and let yoursibling know that this house belongs to you in Virtual Step Brotherfamily Simulator. Game Play: In this game you are playing as a sonof a single father, but one day your father bring a women and achild almost same as your age and tell you that he is your stepBrother and Step Mother. Now everything has to change as it was allyour room before but now you will need to share it with your StepBrother in Virtual Step Brother family Simulator. You will need toshow him that this is your house not his. You will be doing thefollowing task during the game and many more…. • Need to finddifferent things in the house. • Follow the instruction and movearound the house. • Tease your Step Mother to show your anger. •Feed the Pet Dog. • Win the Pillow Fight with your Step Brother. •You need to put On the fire and Spoil the clothes on mom's life.Key Features: • Play as Step brother and never fulfill yourresponsibilities. • Beautiful Home Environment. • Third Person GamePlay. • Super Virtual Family games moms like. • Addictive gameplayand exciting missions with family adventure. This family adventureis full of entertainment and joyful activities. Steal the food fromyour lovely Step family. In this amazing simulator you will Teasethe hell out your mother and maintain your beautiful house. Thereis many more level based mission to complete with numbers ofinteresting activities. Make your Brother things disappear alongwith the car keys . Don’t let your Virtual Step Mother performhome, caring, cleaning and cooking tasks in the housekeeping game.Be a Super Villain Virtual Step Brother in happy family Simulator.